Click the "Remove Duplicates" command on the Tools menu. VueMinder provides the ability to remove duplicate events, tasks, or notes within a selected calendar. This feature is available via the "Remove Duplicates" command on the Tools menu. Normally, duplicates shouldn't appear. However, unexpected syncing glitches can sometimes result in duplicates appearing. The "Remove Duplicates" feature enables those duplicates to be easily removed. 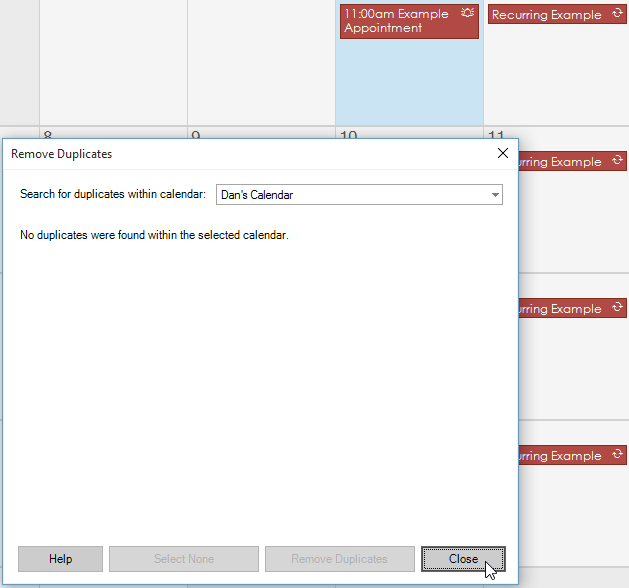 The Remove Duplicates window will list all the duplicate items found in the selected calendar. 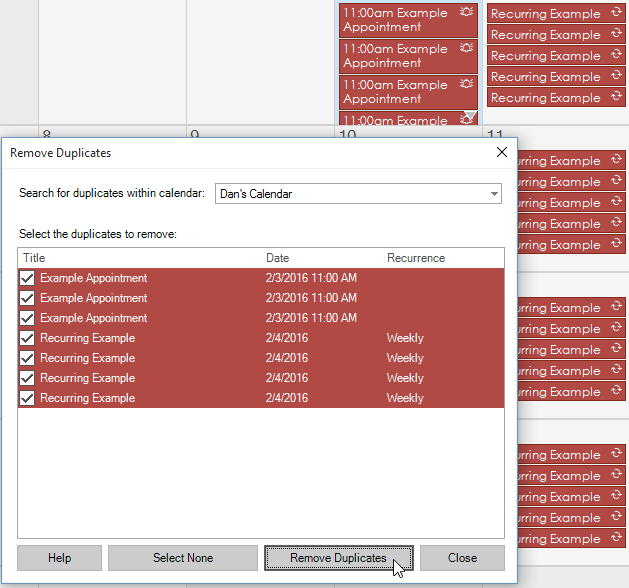 A different calendar can be selected from the drop-down list near the top of the Remove Duplicates window. By default, all duplicates will be selected for deletion. The checkboxes can be used to select which duplicates should be removed. The "Select All" or "Select None" buttons can also be used to check or uncheck all items. Only calendars that can be edited will be listed. If you have duplicates in a subscribed or read-only calendar, those duplicates will need to be removed by the calendar owner. After clicking the "Remove Duplicates" button, the duplicates will be removed from the calendar, leaving only 1 instance of each duplicated event, task, or note. If the items were deleted from a calendar that syncs externally (such as Google Calendar or Outlook), the deletions will also sync and will be removed from the external calendar.